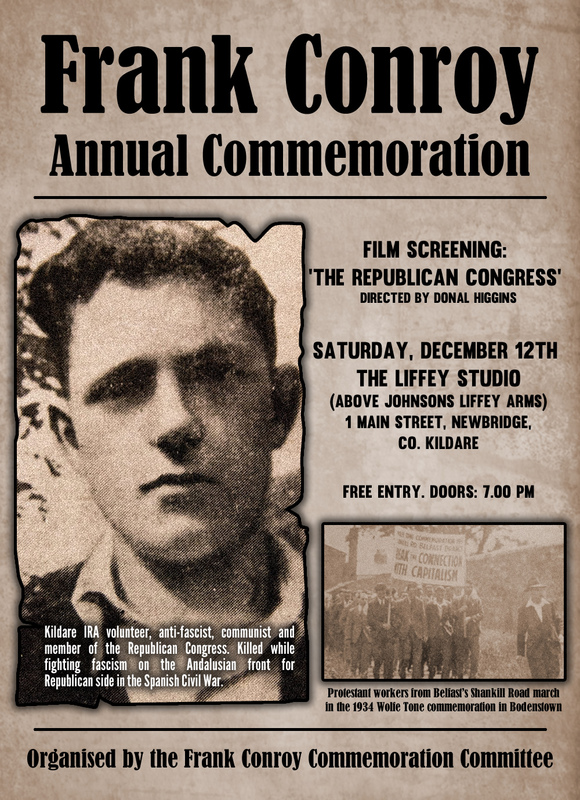 On Saturday 12th December 2015, a very interesting Frank Conroy Commemoration took place in The Liffey Studio, Newbridge. The commemoration featured a screening of the new documentary The Republican Congress, presented by Donal Fallon and directed by Donal Higgins. The film tells the story of the political organisation that was founded in 1934 by Left-wing republicans Nora Connolly O’Brien, Roddy Connolly, Frank Ryan, George Gilmore and Peadar O’Donnell. Conroy, who had been an IRA and Republican Congress activist, died in 1936 fighting with the International Brigade in Spain. Red nationalism of the blood or cultural gesture? The issue of support for Germany indicates some of the divergences between Connolly and Lenin. A major study written by a follower of Greaves was forced to conclude that Connolly “underestimated considerably the role of German imperialism. While understanding the roots of the war to be economic… he nevertheless overlooked the aggressive nature of German imperialism…Undoubtedly much of what Connolly wrote during this period was directly propagandistic…but his arguments concerning the imperialistic nature of the war lack the perspicacity and directness which are evident in Lenin’s articles of the same period” (Metscher, 1986). “Deep in the heart of Ireland has sunk the sense of the degradation wrought upon its people – our lost brothers and sisters – so deep and humiliating that no agency less potent than the red tide of war on Irish soil will ever be able to enable the Irish race to recover its self-respect or re-establish its national dignity in the face of a world horrified and scandalised by what must seem to them our national apostacy. Without the slightest trace of irreverence but in all due humility, and awe we recognise that of us, as of mankind before Calvary, it may truly be said: ‘Without the shedding of Blood, there is no Redemption'” (Yeates, 2015, 319). Comments Off on Red nationalism of the blood or cultural gesture? Born in 1868 in Edinburgh of poor Irish parents, James Connolly is one of Ireland’s most important and controversial historical figures. He is known as Ireland’s foremost marxist thinker and activist, the working class leader who effected a union of socialist and nationalist forces in a radical anti-imperialist front. 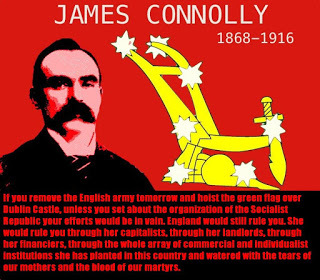 In 1896 he founded in Dublin the Irish Socialist Republican Party “to muster all the forces of labour for a revolutionary reconstruction of society and the incidental destruction of the British Empire” (Connolly 1973, 167), and remained committed to that aim until his death. Financial difficulties forced him to emigrate to the United States between 1903 and 1910 where he worked as an organiser for the Industrial Workers of the World (better known as the Wobblies). After his return to Ireland, he became the Belfast organiser of the Irish Transport and General Workers Union from 1911 to 1913, was then deeply involved in the great Dublin lock-out of 1913-14 and had a key role in organising the Irish Citizen Army – a workers’ defence force. 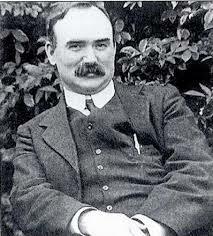 Connolly was an outspoken opponent of Irish involvement in the First World War. A convinced socialist revolutionary, he was at the forefront of the struggle against the British Empire and allied with the revolutionary Irish nationalists to organise the 1916 Easter Rising. One of the signatories of the Proclamation of the Republic, he was appointed vice-president of the Provisional Government of the Irish Republic and commandant-general of its army. Wounded in the Rising, he was shot in a chair by the British authorities on 12 May 1916. Throughout his life, Connolly was a prolific writer, and maintained a constant stream of books, pamphlets articles and speeches. His work is almost exclusively centred on Ireland and was elaborated largely in isolation from the international socialist movement and for that reason is not well known globally. 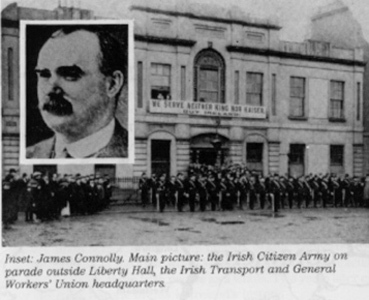 James Connolly, Germany and the First World War: Was Connolly a proto-Lenin? This article will question the thesis that Connolly’s stance on the First World War was similar to that of Lenin’s and argues that he favoured a German victory on socialist grounds. Lenin saw the First World War as a product of the general crisis of capitalism and imperialism and sought to transform the imperialist war into civil war. Connolly’s stand on the first world war as W.K. 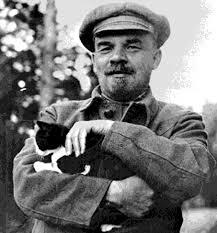 Anderson notes “frequently been compared with Lenin’s” (W.K. Anderson (1994), James Connolly and the Irish Left, Dublin: Irish Academic Press, 63). It is often assumed that Connolly’s position on the question of the First World War was, with only minor if any qualification, similar to that of Lenin and the Bolsheviks. C. Desmond Greaves, for instance, argues that “Connolly’s thought ran parallel with Lenin’s… almost phrase by phrase” and only the Irish labour movement together with the Bolsheviks and the Serbian socialists opposed the war (C.Desmond Greaves (1961), The Life and Times of James Connolly, London: Lawrence & Wishart, 353). Bernard Ransom’s study of Connolly’s marxism has argued along similar lines that Connolly’s stance on the First World War was substantially similar to that of Lenin’s (Bernard Ransom (1980), Connolly’s Marxism, London: Pluto Press, 79). Such has been the accepted viewpoint for many studies of Connolly. This has less to do with Connolly’s actual stance on the First World War than using Connolly as a trojan horse to introduce Leninism in Ireland. Comments Off on James Connolly, Germany and the First World War: Was Connolly a proto-Lenin?